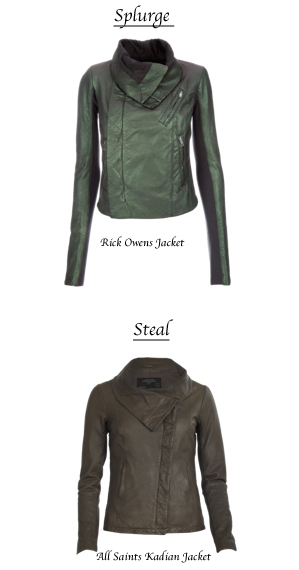 I was at Harvey Nichols last Saturday when a rack of Rick Owens leather jackets caught my eye. Well, you can imagine my response. Thank goodness for my inhaler because it comes in real handy when I hyperventilate. Recently, I had to fill in a questionnaire regarding my annual asthma checkup for my GP. Do you still require your Ventolin? Why yes, although I'm much better these days, I carry it around just in case I see my holy grails on sale. Hmm.... I guess that wouldn't go down too well with my doc. Annnnyway, after a 60% discount, it was still approximately £560 but wait, there's more (I'm channeling TV adverts here), there's an additional 10% discount on top of the markdown price. £504! For a Rick Owens jacket, it's remarkably "cheap". Off I went to the fitting room. It was way too snug. I could barely move my arms. The sleeves were so narrow that unless you have stick thin arms and a flat chest, I really can't see how most women could wear a size 40. The weirdest thing was I could fit into a full priced black version of the leather jacket from the current collection but not the one I was trying on. It just goes to show how inconsistent the sizing can be. At this point in time, I just can't bear forking out £1400 for an identical jacket from their Autumn/Winter collection. I have several All Saints leather jackets, and I love them all. The sizing has always felt perfect. I would highly recommend them for a "steal" alternative to Owens. I love that All Saints jacket too! I always wanted a Rick Owens jacket..
504 Pounds...how I wish I'd live in London now; the Rick Owens jacket is number 2 after my planned splurge on a Chanel 2.55 this year, but for this price (still a lot but compared to the original price) I would have gone for the jacket first. Too bad the jacket didn't fit you! AA, MMC and Kate, I just can't make myself hand over such a large sum of money for a leather jacket. Well, not now anyway. I'll have to look harder for the Kadian. Sog19b, LOL. Thank goodness it didn't fit me or else I would've been in serious trouble. lauraloo, imagine a scarecrow with the arms stretched out. That was me when I wore the jacket.